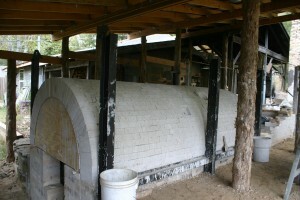 New two chambered kiln (still under construction), the first chamber is an anagama and the second is a noborigama salt kiln. I so enjoyed touring the pottery and textile studios and your gallery. I read your daughter’s post and am fascinated by your lives. My new acquisition, the Angry Trout sculpture is now on our dining table. When we return to Ozark and Oark I plan to bring it with me for Stephen to sign. If he wants. I will share your website with friends as I show them the sculpture. I am glad you enjoyed discovering our place and appreciate very much you acquiring one of my fish sculptures. I am very happy that it has found a good home. My piece is signed. On the home page of this website is my logo, a hexagon with butterfly in it. This is how I sign my work and have done so since 1975. It may be hard to see but should be somewhere around the base of the piece. I do forget to stamp my work on occasion but am pretty sure that piece is signed. Next time you visit I can tell you the story of how the butterfly became the symbol to sign my work.